While some in the media have chosen to focus on the handful of thoughtless individuals who threatened and blamed Michigan punter Blake O’Neill for Michigan’s loss to Michigan State, thousands more have shown their support for O’Neill. O’Neill fumbled a snap which was recovered by MSU’s Jalen Watts-Jackson who ran 38 yards for a touchdown and a 27-23 Spartans victory as time expired on Saturday at Michigan Stadium in Ann Arbor. Some took to social media to harass O’Neill for the play that will be remembered for years, but even more have shown their support. The support has come from players, coaches, sports analysts and fans. 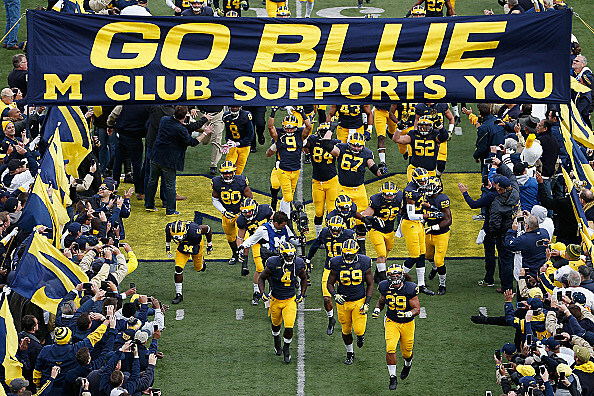 The support has come from Michigan, Michigan State and those who don’t normally follow sports. The nasty comments do not reflect the feelings of 99.9 percent of people. Showcasing the ugly comments without discussion does nothing but increase the pressure these cyber bullies are putting on O’Neill. It’s unnecessary. Just so you know: we’re not showing you the tweets from the human manure sacks that threatened and insulted Michigan punter Blake O’Neill in the wake of the Wolverines’ loss to Michigan State on Saturday. Sacks of manure posing as people don’t deserve the attention. Exactly. Rude comments like these are often found on message boards and social media after games, when discussing politics and in other situations. Why give irrational people a megaphone? Let’s keep the focus on the great game that was played in Ann Arbor on Saturday, not on the careless words of a few. Let Michigan State enjoy their win and let Michigan punter Blake O’Neill continue his solid season by playing hard for the Wolverines. If you are harassing the Michigan punter, be aware it says a lot more about you than it does him. He gave his best, while you are a lowlife. I've never seen a game end like the Michigan-Michigan State game. Incredible win for MSU but I feel terrible for the Michigan punter. I will always support @blakewoneill to punt 80 yards is amazing. Everyone has their moments. But he is a great punter. Onto next week.